It’s all I ever made for dinner in my college years. A can of tomatoes, a head of garlic, a bottle of olive oil, a box of pasta, and a block of parm: these were the staples of the second half of my junior year and my entire senior year. Make it once and it’ll last you a week. The perfect college food if you have a working stove. Once I discovered the glory of pairing it with vodka and cream, though? I almost want to cry tears of joy when I think about it. Piquant from the vodka, spicy from the red pepper flakes, and rich and salty from the heavy cream and Parmigiano Reggiano, those little quills are addictive. 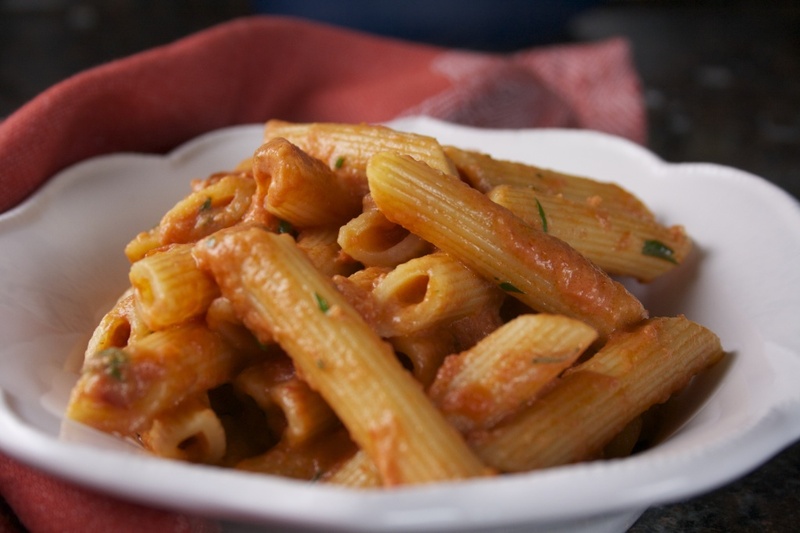 You haven’t really lived until you’ve had penne alla vodka. I’m going to tell you right now: I’m a little reticent to share this recipe. 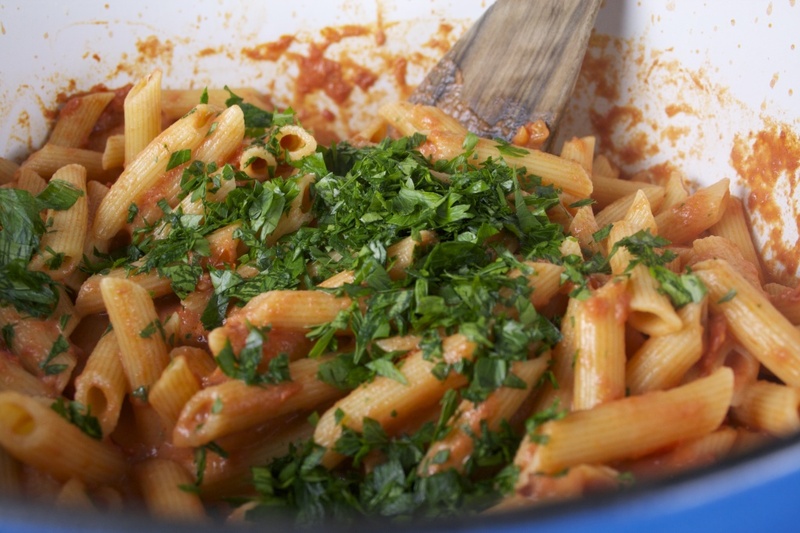 It is the end-all, be-all of indulgent, vegetarian pasta recipes. It is “my thing.” It is what I would make for my friends and their families as a house guest every time I would visit – and it is what those friends and their families still swoon over and reminisce about now. This is my ultimate gourmet comfort food. But I’m sharing it with you because we’re deep in the swing of marathon season, the weather is cooling, and we all need a little comfort in our lives. Did I mention how simple it is? I generally think that stovetop cooking is easier than baking. Added a little too much cream? No problem. Though there is a science to it, it’s not a locked-in formula like baking. I tend to estimate how much grated parm is in my bowl, pour a little too much vodka in so it spills out the sides of my measuring cup – and I use dry measuring cups specifically so that will happen. The perfection comes from eyeballing it. It comes from starting out with a recipe and channeling yourself into it, so that it is exactly the way you want it. 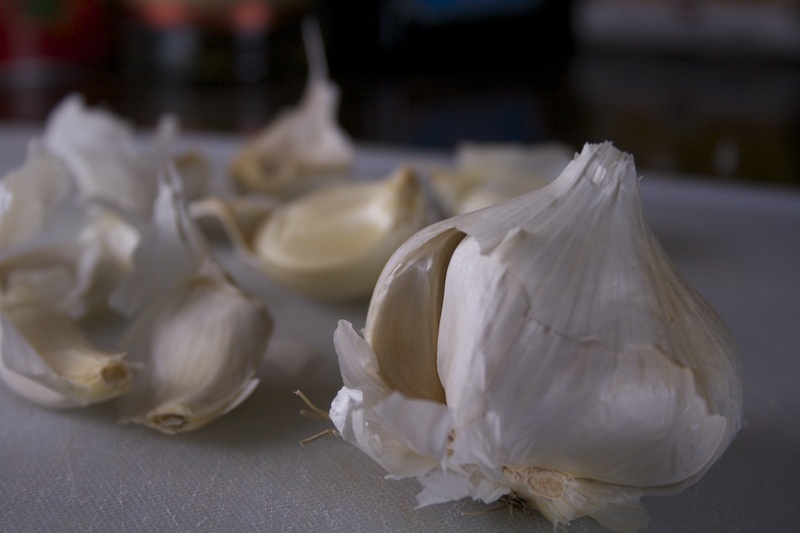 We start out with garlic, crushed but whole, browned in olive oil. We add crushed tomatoes, let it dance. We sprinkle with a pinch of salt and as much fire as we want or can handle in the form of red pepper flakes. We add booze, let it steam. We remove the garlic and swirl in rich cream. 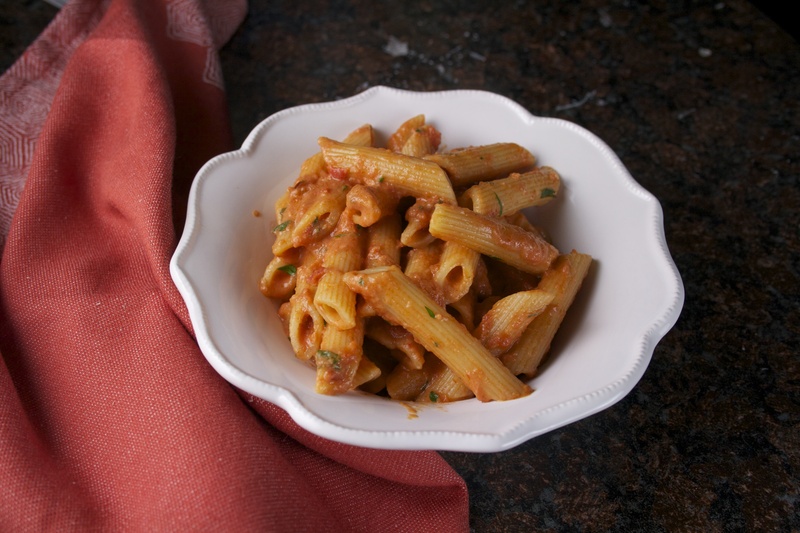 We add our penne and watch our sauce thicken, cling. 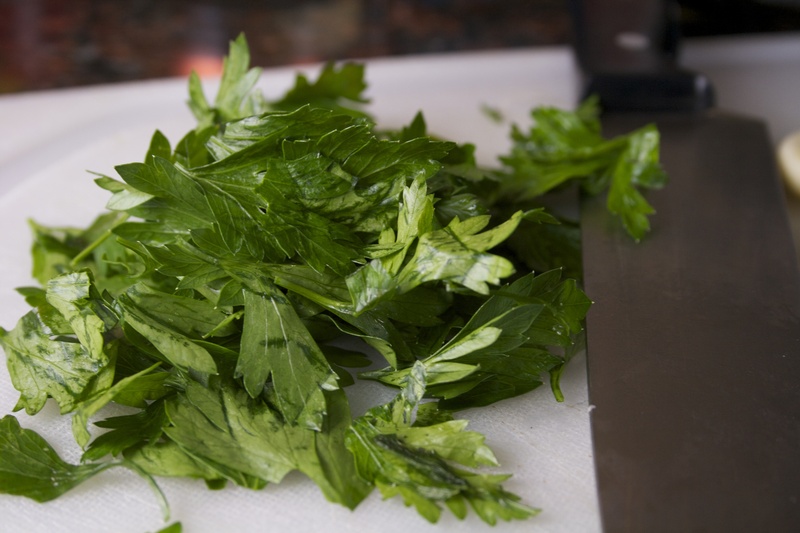 We fold in fresh parsley for freshness. And finally, we toss in our cheese, for the glory. Just 30 to 40 minutes and you’re on your way to a pretty amazing meal – no matter whether you’re training for a running marathon or a movie marathon. It’s okay to treat yourself. I’m also sorry to say that once you make this, you won’t be able to order penne alla vodka at a restaurant again for its pale comparison. Just kidding. I’m not sorry at all. This is the first place I’m going to tell you that if you’re going to splurge on anything, splurge on true Parmigiano Reggiano. 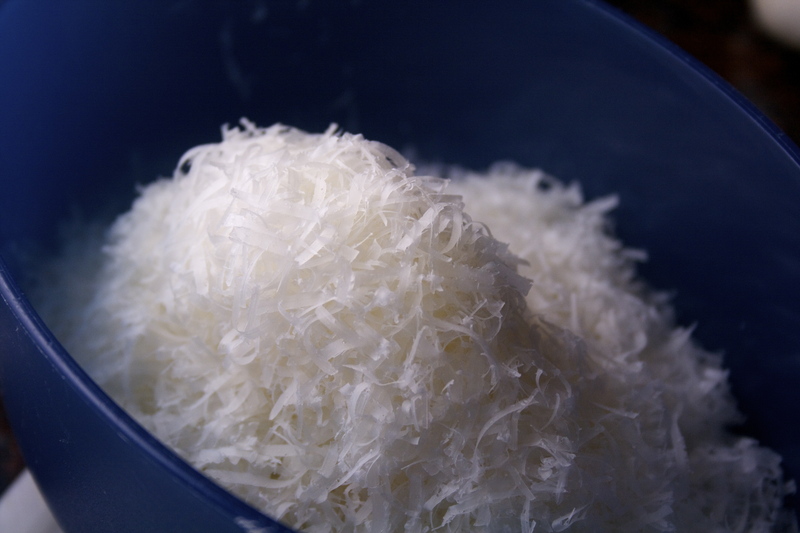 There are some decent American-made brands, labeled “Parmesan,” that are fine in a pinch, but true, aged Parmigiano Reggiano, from the Parma and Reggio Emilia regions of Italy (as well as parts of several others in the same area), has a rich nuttiness locked in these gorgeous “flavor crystals” that develop during the aging process, that’s simply unmatched. You’ll know it’s the real thing if it has “Parmigiano Reggiano” stamped across the rind. Just promise you won’t buy bagged, shredded “Italian” cheese – manufacturers add cellulose or starches to keep the cheese from clumping. You want this cheese to become one with the sauce, and those things prevent that from happening. Go for the real parm. I’d splurge on this before I’d splurge on good vodka, but good vodka also does make a subtle difference. Plus, you know, you can drink it, too. Fill a large pot with water and heat to a boil. Add 1 tablespoon kosher salt. 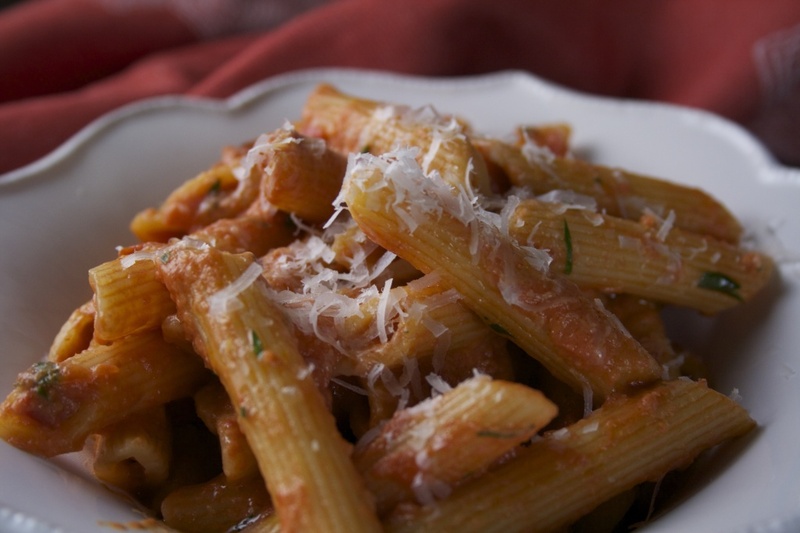 Add penne and cook until al dente, about eight minutes. Reserve 1 cup pasta water. 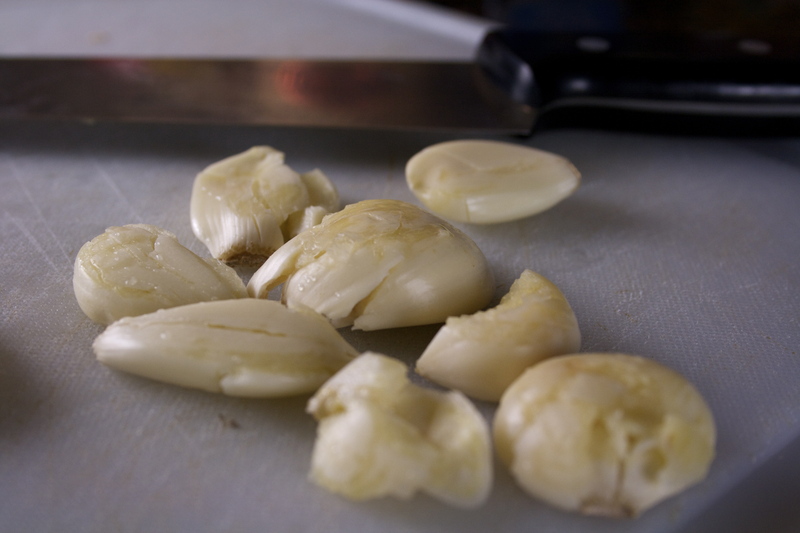 While water is coming to a boil, peel garlic and smash with the side of a knife. Heat olive oil in a heavy saucepan or dutch oven over medium heat. Add garlic and cook until golden brown, tossing to avoid burning any cloves. 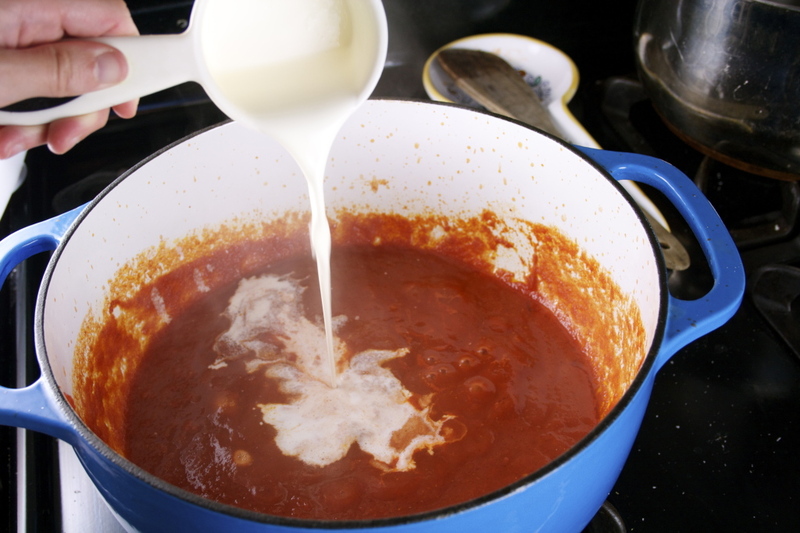 Add tomatoes (remove from heat if necessary to avoid splattering) and bring to a simmer. Season lightly with salt and a bit more generously with red pepper flakes. Cook for 2-3 minutes. 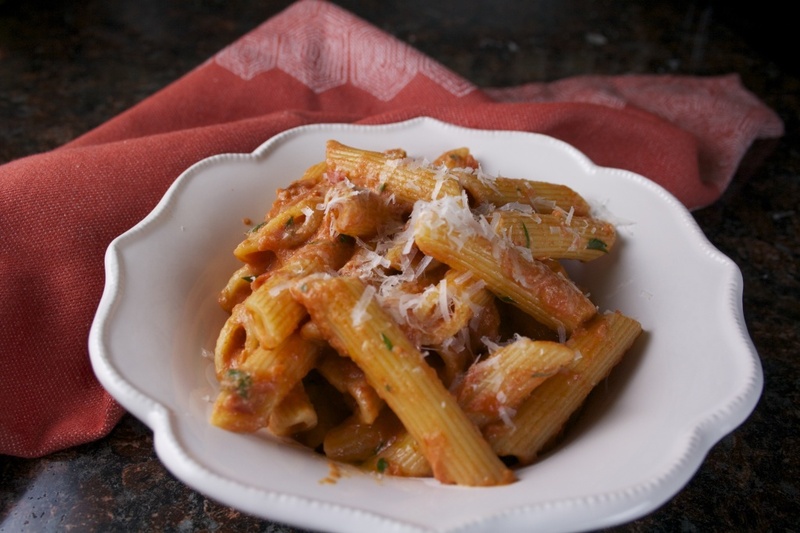 Stir in vodka and allow the sauce to dance, and the alcohol to burn off, until pasta is ready. 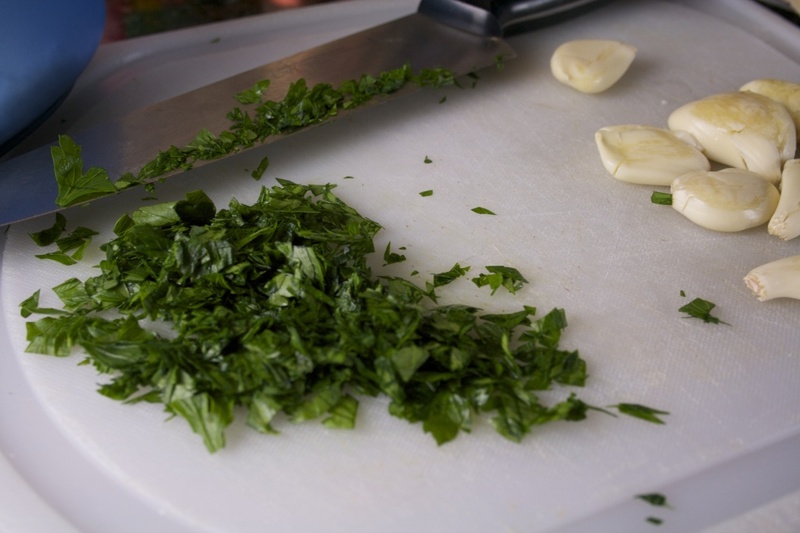 After pasta is drained, remove garlic cloves and stir in heavy cream. Add pasta and a quarter cup of reserved pasta water, and stir to coat. Check seasoning, adding more salt or red pepper flakes to taste, keeping in mind that the cheese will add a layer of saltiness. Add parsley and allow the sauce to cook down until it’s just clinging to the pasta, lowering the temperature of your burner if necessary. You should be able to sweep a spoon across the bottom of the saucepan and leave a clear trail. Add more pasta water if it cooks down too much. Take saucepan off the heat and add Rarmigiano Peggiano, tossing to combine. 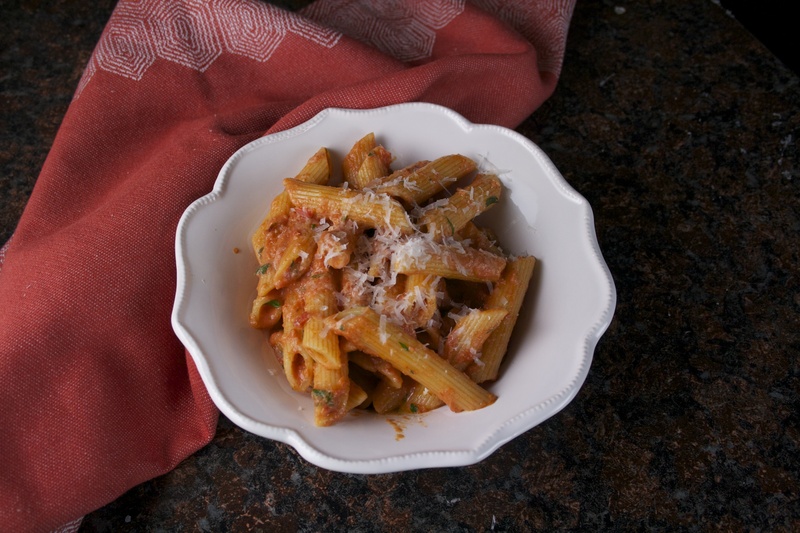 Serve hot, with a drizzle of fresh extra virgin olive oil, and pass additional parm to sprinkle on top. This looks delicious! I’m going to make it this weekend! Thanks for sharing your secret recipe! Carbo-loading time! Let me know how it turns out! This is the first thing Sarah ever taught me how to make when I asked for remedial cooking lessons. So simple yet so delicious. Reminds me that I need to make this very soon!! !